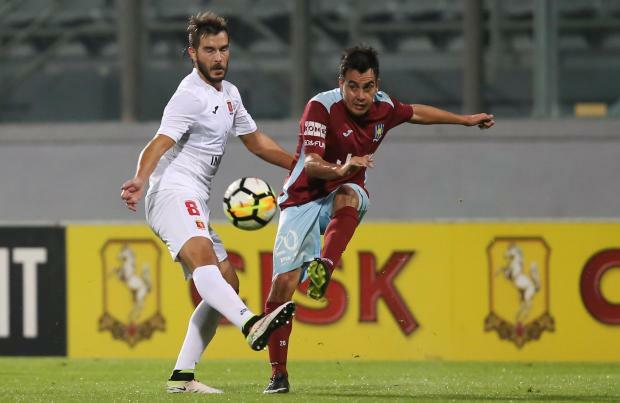 High-flying Gżira United and champions Valletta fired a blank in the top of the table clash. So, the outcome maintained the status quo between the two sides in a drab encounter with few goal-scoring opportunities. Valletta did their very best yesterday to topple the gallant Gżira but they were kept at an arm’s length by the spirited disposition and sound tactical play of their opponents. Darren Abdilla was forced into his first substitution after just 15 minutes as Haruna Garba was unable to continue after picking up an injury. Kaljevic tested the waters with a low drive which Haber saved easily. Then, Alba powered his way down the left flank but scuffed his effort wide and high. The loss of Amadou Samb to injury inside the opening 35 minutes didn’t help Abdilla’s plan again. The second half was less than three minutes old when Santiago Malano found himself on the end of a blocked attempt by Fontanella but the Argentine midfielder mishit his shot. On 53 minutes, Alba evaded the attentions of Veronese before he whipped in a trademark cross but Fontanella’s header dropped into the hands of Haber. Joseph Zerafa had already been booked when he hauled down Roderick Briffa on 57 minutes and was red carded. Ironically, with only 10 players on the pitch, Valletta finally fashion a good chance as Picciolo fed Alba whose diagonal shot produced a great save by Haber. The end came with the Maroons clinging on what they had started with as they were definitely the more satisfied team. Miguel Alba of Valletta was the BOV Player of the match.